The 'A' packet uses reversed local IDs to simplify acknowledgement procedures; i.e., local source is the local destination of the 'A'-packet. BC	: Byte count of Node field (n) . BCS	: Block check sum, 2 bytes wide of total packet (18+n) bytes. 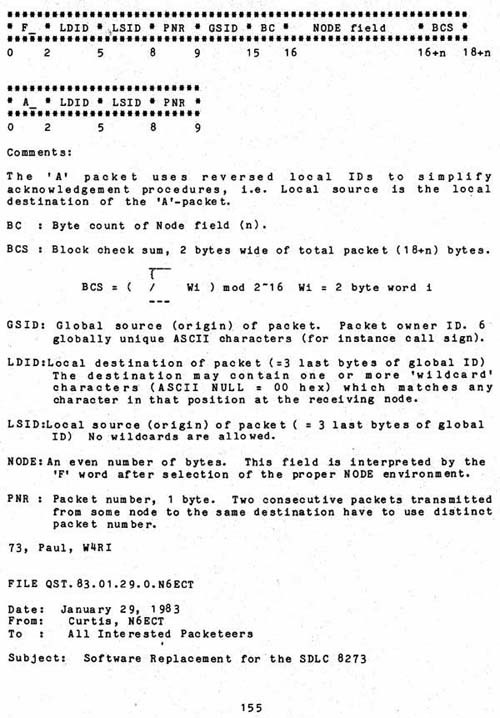 GSID: Global source (origin) of packet. Packet owner ID. 6 globally unique ASCII characters (for instance call sign). LDID:Local destination of packet (=3 last bytes of global ID) The destination may contain one or more 'wildcard' characters (ASCII NULL = 00 hex) which matches any character in that position at the receiving node. LSID:Local source (origin) of packet	(=3 last bytes of global ID) No wildcards are allowed. NODE:AN even number of bytes. This field is interpreted by the 'F' word after selection of the proper NODE environment. PNR : Packet number, 1 byte. Two consecutive packets transmitted from some node to the same destination have to use distinct packet number.